It is now public knowledge that Exxon has known for decades that their core business is directly responsible for climate change. Even more damning is the fact that they covered up this knowledge. To make matters even worse, they actively participated and funded a sophisticated campaign to fuel climate denial and delay climate action as long as they could. As reviewed by InsideClimate News, an 8 month multi-part investigative exposé, Exxon’s own research proves that they were aware of climate change and the salient role played by fossil fuels all the way back in the 1970s. 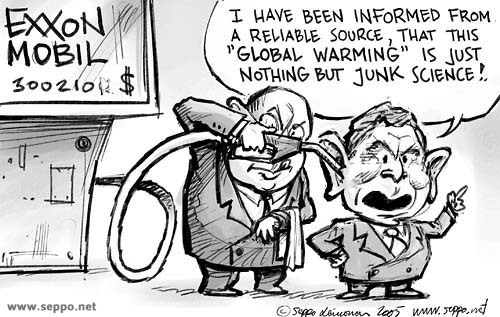 In 1977, Exxon’s own scientist James Black said that there is general scientific agreement that the most likely manner in which mankind is influencing the global climate is through carbon dioxide release from the burning of fossil fuels. At a meeting in Exxon Corporation’s headquarters, Black told the company’s Management Committee that CO2 generated by fossil fuels would warm the planet and could eventually endanger humanity. Black even mentioned the implications for food scarcity, warning that in some places “agricultural output [would be] reduced or destroyed,” Exxon’s research included climate modeling of the greenhouse effect and a tanker that traveled the world to measure carbon dioxide levels in the ocean and atmosphere. The tanker project ran from 1979 to 1982. Other scientists began to publish their own research linking fossil fuels and global warming. As the public began waking up, in 1988 Exxon ended its CO2 research and unleashed one of the most pernicious and destructive misinformation campaigns ever perpetrated on humanity. Their goal was simple, manufacture an element of doubt into the science of climate change so that they could buy time and bring as much of their climate destroying petrochemicals to market as they possibly could. While they published some of this research in the early 80’s, they soon made a strategic decision to end their greenhouse gas research and pursue a deliberate and willful campaign to sabotage the public’s trust for the science associated with climate change. In 1982, Exxon knew that fossil fuels would be replaced by renewable sources of energy. As Edward E. David, the president of Exxon Research and Engineering, said: “few people doubt that the world has entered an energy transition away from dependence upon fossil fuels and toward some mix of renewable resources that will not pose problems of CO2 accumulation.” Corporate executives did not share this information with the general public or Exxon’s shareholders. They knew that synthetic oil made from coal, tar sands and shale could significantly boost CO2 emissions, but they did nothing to stop or slow production. Rather than heed these warnings, Exxon began investing millions in misinformation and they lobbied to block government action to reduce fossil fuel related emissions. Exxon was a founding member of the alliance of large corporations that formed the Global Climate Coalition, to halt government efforts to curb fossil fuel emissions. To execute their devilish plan, Exxon used the American Petroleum Institute and pseudo-scientific research from think tanks. As reviewed by Triple Pundit, Exxon has funded climate denial lobbying groups like the Heartland Institute. Exxon gave the institute $765,500 over an eight-year period. Exxon continues to take advantage of its deep pockets to provide “contributions” to politicians in a bid to buy their cooperation. Exxon funds members of Congress, like Jim Inhofe, who deny climate change. They also use their control over legislators to kill legislation like the American Clean Energy and Security Act (aka the Waxman-Markey Bill). Exxon’s influence extends to the most powerful office in the world. According to the Hill, in 2001, Exxon Mobil lobbyists helped convince President George W. Bush to pull out of the Kyoto Protocol. In addition to paying off politicians and funding a number of front groups, Exxon also does their own lobbying. Exxon paid researchers to publish papers questioning established climate science. One such researcher is Wei-Hock Soon, he has received extensive funding from fossil fuel companies including Exxon Mobil. Exxon also supports ALEC, a free-enterprise group that has opposed government mandates, subsidies and other efforts to force or encourage companies to develop and use more renewable energy sources. Exxon scientists like Cohen and David who had been pioneers of climate research began to publish views that cast doubt on the veracity of mainstream climate science. This prompted the Royal Society, the United Kingdom’s science academy, to send a harsh letter to Exxon in 2006 accusing it of being “inaccurate and misleading” on the question of climate uncertainty. Bob Ward, the Academy’s senior manager for policy communication, demanded that Exxon stop giving money to dozens of organizations he said were actively distorting the science. Through deliberately misleading campaigns like the so called “climategate” scandal, deniers sought to discredit the scientists who contributed to climate research. Michael E. Mann, Director of Penn State Earth System Science Center; author of ‘Dire Predictions’ and ‘The Hockey Stick and the Climate Wars’ was one of the scientists that Exxon’s disinformation illegitimately sought to discredit. Exxon is also trying to discredit the journalists who exposed the company’s systematic obfuscation. A November 2015 New York Times article indicated that New York attorney general Eric T. Schneiderman was exploring the grounds for legal action against Exxon. Schneiderman issued a subpoena to Exxon that demands financial records, emails and other documents. A New York statute known as the Martin Act may make it easier to secure a conviction than under financial regulations. Others are also calling for legal action including Democratic presidential contenders Hillary Clinton and Bernie Sanders. Environmental Defense Fund President Fred Krupp and 49 leaders from environmental, indigenous and civil rights groups signed a public letter asking US Attorney General Loretta Lynch to launch a probe into Exxon. They specifically want Lynch to determine whether Exxon knew about the dangers of climate change as it funded efforts at climate denial and systematically misled the public. Sharon Eubanks, a former Department of Justice prosecutor who helped win racketeering convictions against tobacco industry execs in 2006 is also among those calling for a criminal investigation. She specifically suggested that Exxon should be investigated under Racketeer Influenced and Corrupt Organizations Act (RICO) action. Exxon’s malfeasance has succeeded in slowing climate action and this will have calamitous repercussions. There is a parallel between Exxon’s subterfuge and the tobacco industry’s criminal culpability for their failure to disclose its own research about the serious health dangers associated with smoking. However, there is a powerful difference, unlike big tobacco’s lies, Exxon’s deceit imperils all life on the planet.